Active throughout Plymouth and South Hams, Business Card Xpress provides a unique hand delivery service that ensures over 10,000 local properties will receive your business card details. Printed on 350gsm card, the details of each business is printed onto an A3 sheet tri-folded to allow it to go through any size letterbox. Every card included on the sheet is designed to be easily removed from the overall pack, allowing recipients to remove and save those that are most helpful or relevant to them. Having said that, due to the variety of services offered to them, many households have a tendency to hold onto all the cards in case something comes up down the road. Business Card Express aims to provide an effective, yet cost-effective, means of marketing local businesses to the residents of Plymouth. 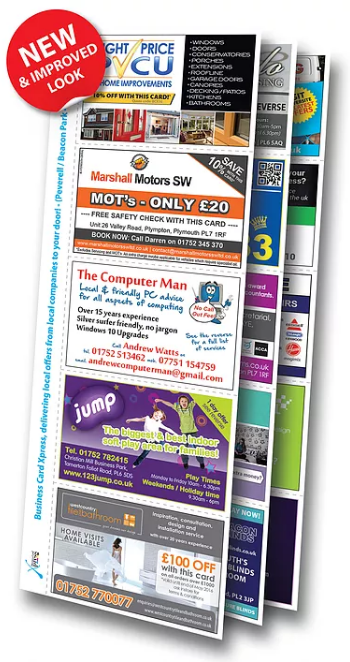 Covering various areas including Plymstock, Plympton, Crownhill, St Judes, Mutley Plain, Ivybridge, and many more, Business Card Xpress prides itself on being able to offer its customers competitive prices and measurable levels of effectiveness. Furthermore, to allow businesses to track how many homes have received their details, Business Card Xpress utilises a door-to-door GPS tracking system that provides detailed information on where and when their business cards have been delivered. This information can be easily viewed by each of Business Card Xpress’ customers, allowing them to see for themselves just how much reach their individual marketing campaigns have. You can also order an additional 500 business cards on 400gsm card with every Business Card Xpress order. Full-colour designs can be comfortably accommodated, and it will only cost £49 (Ex. VAT) for single-sided cards or £69 (Ex. VAT) for double-sided cards. Each business card order includes free delivery. For more information, call 01752 691007, or visit www.businesscardxpress.co.uk.